Happy Birthday to my husband today! I just wanted him to know that I am thinking of him today. He is, of course, traveling on his birthday so it is hard to celebrate with him – so I am shouting out a birthday wish on this post. He had a 4am pickup this morning, which was a special birthday treat. Haha! I guess birthday celebrations are less exciting as we get older. I have known my husband since he was just turning 15 years old and now he is turning … well, maybe we shouldn’t go there. Let’s just suffice it to say that was a LOOONG time ago! (Haha! Just kidding babe, you’re not that old. Well, actually … at least you are younger than me.) This is a fabulous song and just totally makes me think of him when I hear it. Happy Birthday to my One! This song is by Tyrone Wells, one of my very favorite singer-songwriters. It is always hard to pick a single song to share by some artists when you like all of their music. 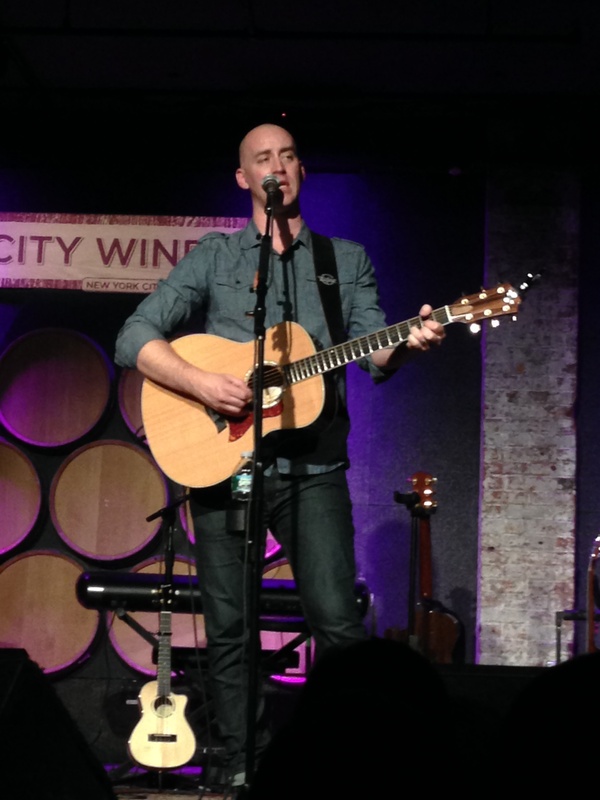 I had the pleasure of seeing Tyrone in concert on Wednesday night in NYC at City Winery. What an incredible venue and just an amazing performance! I think you can totally tell a real talent when it is just an artist up on stage with his guitar singing. This tour was called “Closer Than Ever” and he made a point to return to his beginnings by performing at small, intimate venues across the country. It was just an incredible evening! Tyrone Wells is an amazing storyteller. He tells beautiful stories in his music and he was a great story teller on stage – he was at times hilarious, thoughtful, and poignant. He shared many stories and made a real connection with his audience. His show was sold out on Wednesday night and it sounds like that has been the case around the country. I would definitely see him again and would strongly recommend that if you get a chance to see him, you should take it. I believe there are only four more shows left on this particular tour in the next few days, but if you live in Phoenix, Denver, Minneapolis, or Chicago, you are in luck! I love this song I am posting today, but you should definitely check out all of his music. A couple favorites that you might enjoy: “Running Around in My Dreams” (one of my all time favorite songs), “Sink or Swim,” and “Time Of Our Lives” (the perfect graduation song). Yes, I am still that 40-something mom, but I am now 40-something plus one. My kids are lovely and both keep telling me that I look and act much younger than my age. haha! I keep saying that I am “OLD” and they keep telling me that I am not old! I must remember to thank them. Seriously, I do not feel my age … well, some days I do, but I am fighting that. What is the alternative of not growing older? I will happily take another year. I actually enjoy growing older and gaining wisdom, appreciation, and perspective. Life is good and I am happy to have my 40 plus years of memories and experiences to reflect on and look forward to making many more. This has always been one of my favorite songs. I love the lyrics and the message, and the music just makes me feel good – it has a melancholy and reflective feeling to it. Growing up I was a huge Rod Stewart fan. I actually still love him – it is something to do with that voice and that hair, plus he is an amazing soccer (football) player. I saw him live in concert in 1996 when I lived in Phoenix and was 9 months pregnant with my first child. I could sing along with every word to every single song, unfortunately Rod could not. My husband and I went to the concert with my sister and her husband and about halfway through the concert he forgot the words to the song he was singing. He was singing “Hot Legs” – a classic! – and most of the audience just kept singing the words for him. It was hilarious, but a little pathetic. He disappeared from the stage for a minute and came back with a piece of paper and then pretended to act like he just wanted to be on his knees to sing, although we all knew he was really just looking at the lyrics on that paper. Hilarious! Anyway, that was a first and only for me in all my concert experiences, but it does make a great story.